Owners David and Tracy, who, along with a team of specially-trained fudge makers, make this Buttermilk fudge by hand, using traditional recipes and old-fashioned copper pans. They pride themselves on being a family business, making delicious award winning confections. Ingredients are sourced locally and prepared in a traditional way in Cornwall, England. 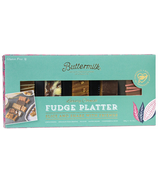 All of their Fudges, are handmade in Copper bottomed pans before being cooled overnight in wooden trays to guarantee a smooth creamy texture without the gritty crystallization or fatty aftertaste left over by many quick cooled varieties.